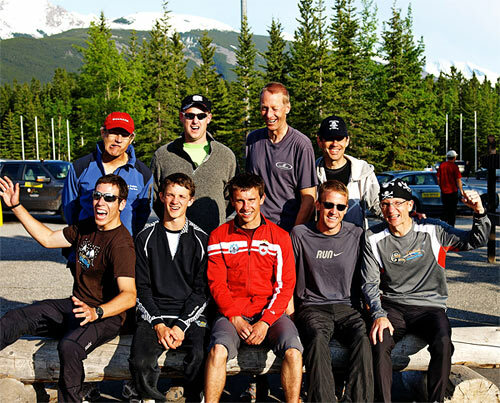 The 2010 edition of the K-100 relay up in Kananaskis was fantastic. The weather was really good this year. Well, there was a bit of rain on leg 7 for us, but it didn’t last very long. We had, on paper, a slightly slower Camrose Pirates team this year, but everyone on the team ran their heart out, and we managed to finish 3rd in the Open category again. Great stuff! I ran leg 5 in a new record for me, 1:12:03 and I am very happy with that time. The competition on this leg is unreal though, so I was only 5th on the leg. Warren ran strong on leg 1, and had a battle with a younger runner, but he prevailed. On leg 2, Kieran ran a solid run and when he handed off to Tom on leg 3, we were ahead of schedule. Tom had a good run as well and smiled all the way. Gerhard worked hard on leg 4 and when I started leg 5, we started getting into the crowded part of the race. I felt really good during and after my run. I sprinted hard to try and get under 1:12 but just missed it. Neal had fun on the downhill fest called leg 6. For leg 7, it was my turn again, since we were short one runner. It felt quite good, I have to say, so I ran about 10 km of leg 7 (37:40) and let Warren finish it off, which he did very strongly. Our youngest runner on the team, Roman, proved his talent to us, when he took it out at a fast pace on leg 8 and kept a good pace all the way. He had never run this far in a race before, and he ended up with the fastest average pace today! Kevin did excellent on leg 9 and we were now way ahead of our schedule. Leg 10 was shortened to about 11-12 km because of the creek being very high. Andrew just rocked on leg 10 and came in fast to the finish. The K-100 Relay is Fabulous Fun! One of the best relays you can possibly do in Western Canada. We’ll be back next year!